Hello Friends welcome to this post of learning trigonometric formulas in an easy way with me . 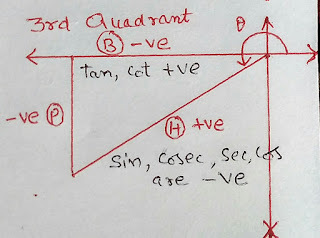 AS most of the Students or Mathematics Learner ,most of the time confuse to remember or memorise value of different trigonometric angles in different quadrants and could not reproduce what they have learnt . 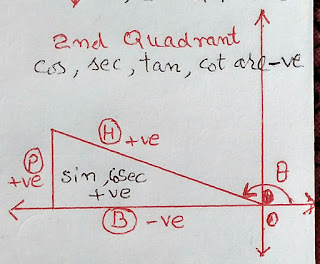 So today we going to learn new techniques to learn "How to memorise different values of trigonometric angles in various quadrants" forever. Before this we must have knowledge of different trigonometric values of different angles in different quadrants. 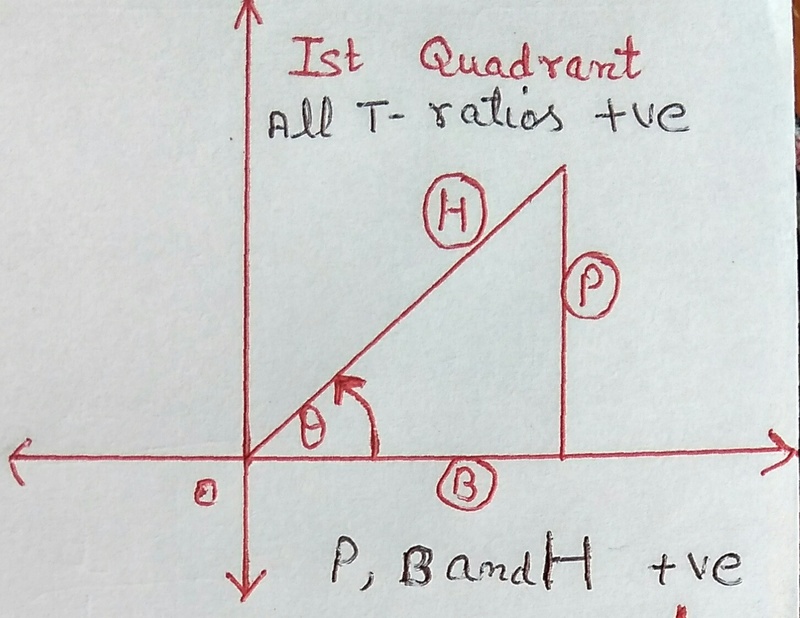 (1) When angle lies in 1st quadrant, then all the t- Ratios have positive values. As in 1st quadrant all the three sides Perpendicular ,base and hypotenuse of right angled triangle are positive. (2) When angle involve π/2 ,then T - Ratios on the left hand side will changes accordingly , if t-Ratios start with "co" , then co will be removed and if it is without "co" then co will be added at the beginning .i.e. sin x will changes to cos x, tan x to cot x , cos x to sin x ,cosec c to sec x and sec x to cosec x. (3) When angle involve π ,then T - Ratios on the left hand side will NOT changes , put the same t -ratios which is on the left hand side on right hand side i.e. sin x to sin x , cos x to cos x , tan x to tan x and so on. ALSO READ MATRIX , DIFFERENT TYPES OF MATRICES AND DETERMINANTS . 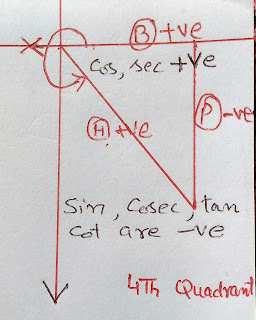 (1) when angle lies in 2nd quadrants ,then only two t - ratios sin x and it reciprocal cosec x shall have +ve values and remaining t-Ratios shall have -ve values. As in 2nd quadrant two out of the three sides Perpendicular and hypotenuse of right angled triangle are positive while base is negative. So in all those t -ratios ,when base involves they will be negative. So cos x, tan x ,cot x ,sec x involve with -ve value of base therefore these t- ratios shall be negative. (2) When angle involve π/2 ,then T - Ratios on the left hand side will changes accordingly , if t-Ratios start with "co" , then co will be removed and if it is without "co" then co will be added at the beginning .i.e. sin x will changes to cos x, tan x to cot x and sec x to cosec x. ALSO READ EASY TRICKS TO MEMORISE A B AND C D FORMULAS IN TRIGONOMETRY . 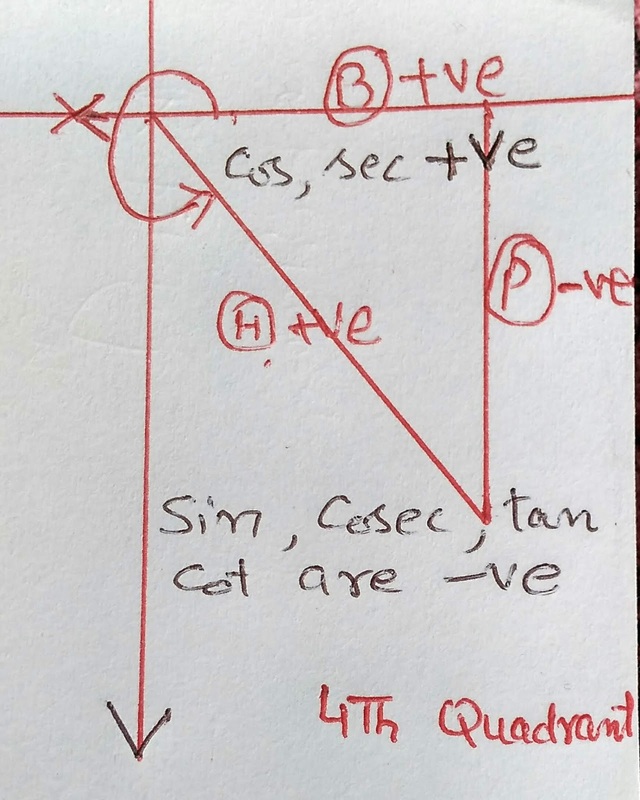 (1) when angle lies in 3rd quadrants ,then only two t - ratios tan x and it reciprocal cot x shall have +ve values and remaining t-Ratios shall have -ve values. As in 3rd quadrant two out of the three sides Perpendicular and base of right angled triangle are negative and hypotenuse is positive. So in all those t -ratios ,when one of perpendicular or base involves they will be negative. So sin x, cos x , sec x ,cosec x involve with -ve value of base or perpendicular therefore these t- ratios shall be negative. And tan x and cot x involves with both -ve values of perpendicular and base so they are positive in 3rd quadrant. 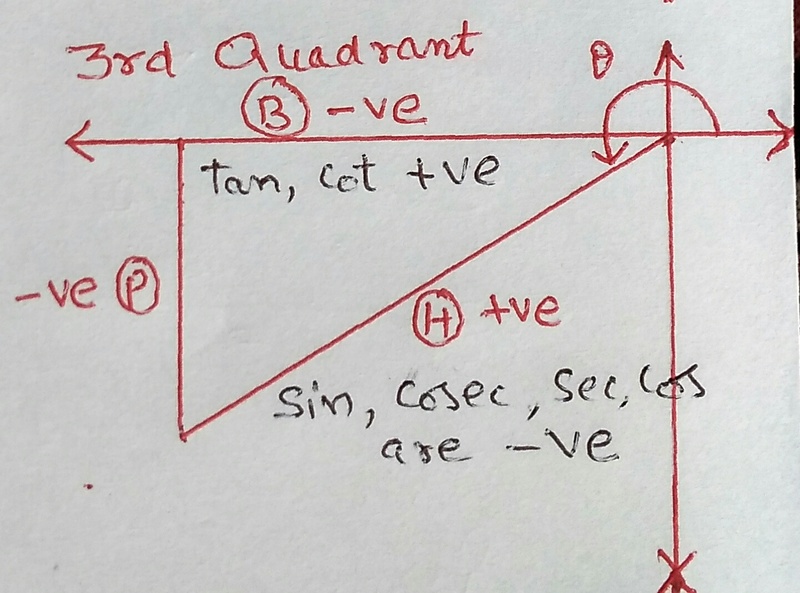 (1) when angle lies in 4th quadrants ,then only two t - ratios cos x and it reciprocal sec x shall have +ve values and remaining t-Ratios shall have -ve values. As in 4th quadrant two out of the three sides Base and hypotenuse of right angled triangle are positive and perpendicular is negative. So in all those t -ratios ,when perpendicular involves they will be negative. 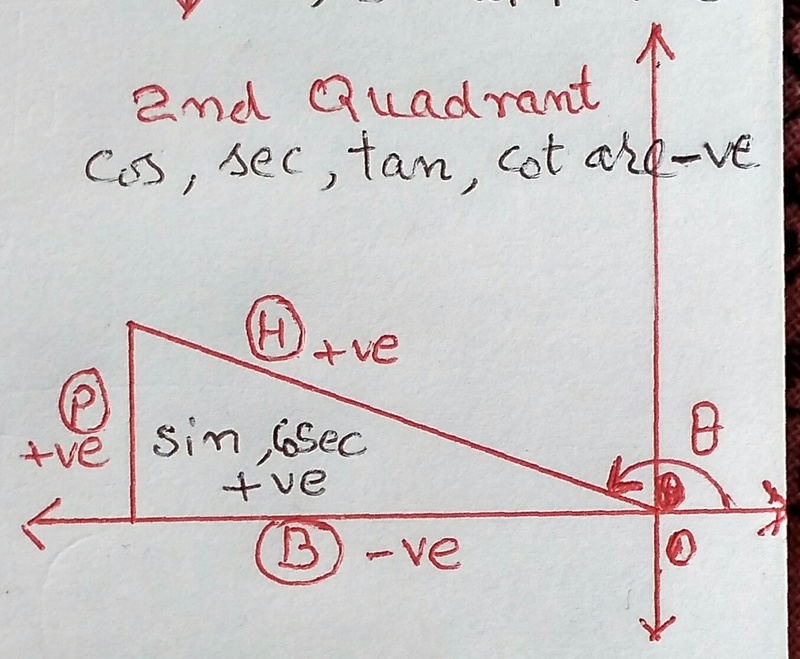 So sin x, tan x ,cot x ,cosec x involve with -ve value of perpendicular therefore these t- ratios shall be negative. ALSO READ HOW TO SOLVE LINEAR EQUATIONS OF TWO AND THREE VARIABLES || MATRIX METHOD TO SOLVE SYSTEM LINEAR EQUATIONS . So when an angle involves integral multiple of π , i,e -3π, -2π, -π, 2π, 3π, 4π then of the T-Ratios will change , But + or - sign can be added at beginning , e. g . sin(nπ + x) may change to + sin x or - sin x ,similarly cos (nπ + x) may change to + or - cos x depending upon the quadrant in which angle lies. and when an angle involves odd integral multiple of π/2 i.e. (2n+1)π/2 , i . e -7π/2 , -5π/2 , -3π/2 , π/2 , 3π/2 , 5π/2. Thanks for devoting your valuable time for the post memorising different values of trigonometric angles in different quadrants of this blog. If you found this blog/post of your concern, Do Follow me on my blog and share post with your friends . We shall meet again in next post ,till then Good Bye.